My second konscht am gronn took place yesterday. I’m happy I resolved the problems I identified with my first. People now come to look at my photos. I can improve this by getting more stands. I still need to find a way to display and package my A3 photos. I have another problem, though. People might look at my photos, but they don’t buy. This will be for many reasons. I could find out why with a market survey, perhaps, but I’ve not done one, and doing one at konscht am gronn might be delicate. Having said that, people come to my stand (now), so if I can persuade some of them to fill out a (short) survey, it could help me no end. In the meantime, there are other ways to work out why people do and don’t buy artwork, though: more on that below. I have to consider that perhaps my photos simply aren’t good enough. If that’s the case, though, then I’m badly misjudging things. I don’t think it is: I get many positive comments, not just from friends and colleagues, and I have rather a lot of self–belief. I do make sales, just not enough of them. So I’m excluding this possibility. Another possibility is Luxembourg. This city is expensive. Flats are small. Perhaps most people do not have the spare money to buy artwork, and, if they do, they’ve nowhere to hang it. So they don’t buy. The people who have a lot of space will have a lot of money, so if they buy artwork, they’re (probably) going to buy artwork for a lot of money. There are myriad galleries targeting them. 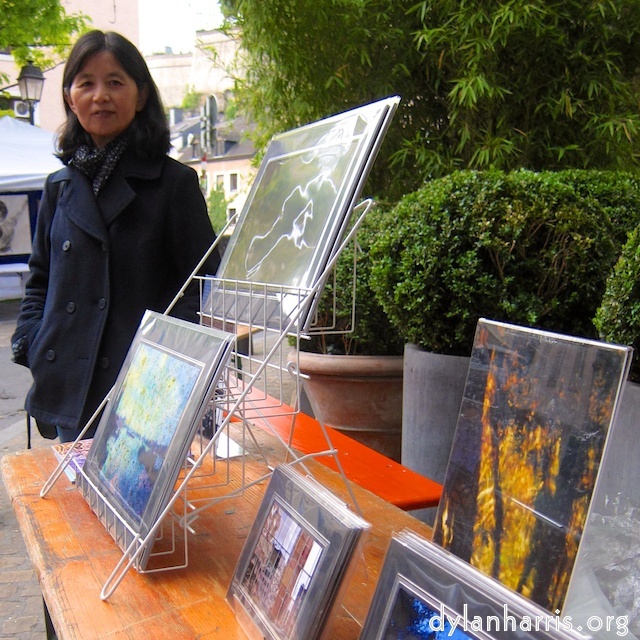 Why should they come to an outdoor arts market? Perhaps they might: I need to work it out. It might be worth my while distinguishing my photography to appeal to these people. I can’t and won’t go against the basic fact of photography, it’s always going to be the common man’s visual art. I can make things obviously exclusive, though, by limiting the prints, numbering and signing them, and making the price so the purchase is something special. After all, buying art is something special. It’s not like buying a loaf of bread. I should respect that. I’ll have to think on this, too. I do just so happen to have an OID, which I got to support digital signing of artworks: perhaps I should use it. It would give me something unique. An artwork is not a thing to buy, use once, and throw away. If it’s bought, it’s bought to be seen, to occupy a space for a long time. So buying an artwork will be a relatively rare event. 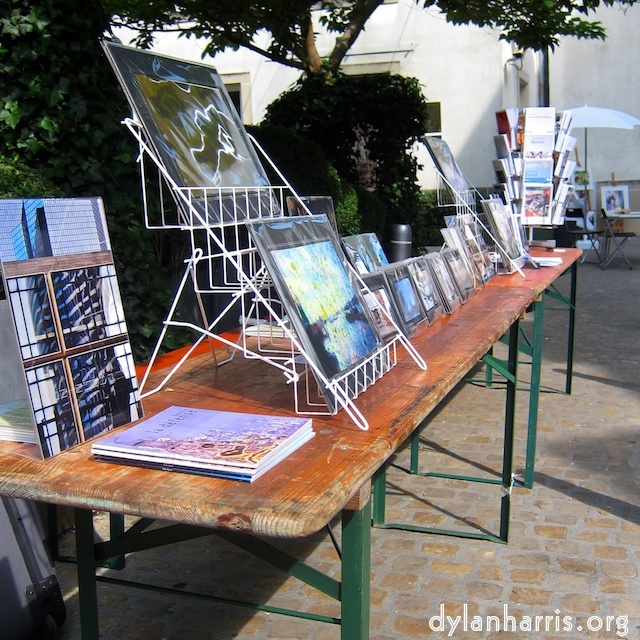 And there’s a lot of competition; a great number of people sell artwork. So sales are difficult. Anyway, the internet, being the internet, has many sites that purport to analyse why people buy art. I’ve no reason to argue with them. Clearly, I have a lot to consider. I need to spend some time to come up with a tactic or two to get results. One thing: I’m not undoing my photography to suite a market, I need to find the right market for my photography. There is the commercial market, but I’m ignoring that for now. Similarly for the galleries. One thing at a time. I have another tactic ready. I’ve got some portraits of poets. I’ve not shown them yet, but I have the poets’ permission to do so. If I do so, the goal is to promote taking portraits. This will have to be limited; I take my portraits whilst I’m in conversation with the subject. It’s not a matter of putting someone in front of a sheet, saying cheese, and taking a snap. It’s catching people playing, it’s putting them somewhere important, or with something important, and catching their reaction. This takes time and effort. It’s about catching an instant to represent a life, whereas portrait painting is about compressing a life into an instant. Konscht am gronn isn’t just about selling things. It’s also about building contacts. And, yesterday, I did get a couple of potentially good contacts. The day wasn’t wasted.